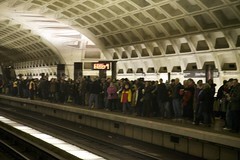 Before last week, the best day on Metro came this past Summer, with 854,000 riders. Yesterday smashed that record. Metro has now released the numbers for yesterday’s totals and they’re astronomical. 1.12M riders on the Metro. Another 423,000 rode Metrobus yesterday, leading to a total public transit ridership of 1.54M people. While it’s safe to say that most of them were headed to the Mall for the Inauguration, not all of them were, which means the crowd estimates around 1.4 million are sounding more and more credible for me. I’m going to come right out and say it: I don’t think this record will fall in the next 5-10 years. While growth has been strong for metro with gas prices on the rise, I can’t see 1.12M riders in a day being topped without some sort of massive event in DC that will bring people from all around. The broad appeal of the Obama Inauguration is going to be hard to beat. Maybe another Tibetan-Freedom-style concert down on the Mall with some monster names would do it, but even then, I can’t fathom them breaking the record. Helloooooo. What about the people who walked or cycled nevermind all those bloomin’ tour buses? batgirl, let’s assume that of the 1.54M who came on Metro, 1.2M (~80%) came to the Inauguration. I’d bet 200,000 is a fair estimate of those who biked, bused, etc, yeah? It’s possible that it was more than that, but that certainly vindicates the 1.4M number and makes the 2M number a little more possible. Out of curiosity, these are trips, right? So the number of PEOPLE who took Metro is probably closer to half of that, right? Surely it is safe to assume that most people who took the metro to the mall also took it home therefore you need to halve the metro figure to determine the number of people who attended by using the metro. The metro figure is for ‘trips’ not people attending the mall. reckons around 10,000 charter buses. If that were true and each was full that would be around half a million people. What nashpaul said. Of course, the number of people who came to the Inauguration but didn’t take Metro or bike must be huge too. People who walked from their residences or hotels and people who arrived via bus, etc. I’m just curious how accurate that number works when we had several reports of a few stations just throwing open the turnstiles and people got Metro rides for free? If anything, it might be higher? I think Metro could easily beat that record if it added another line or two.